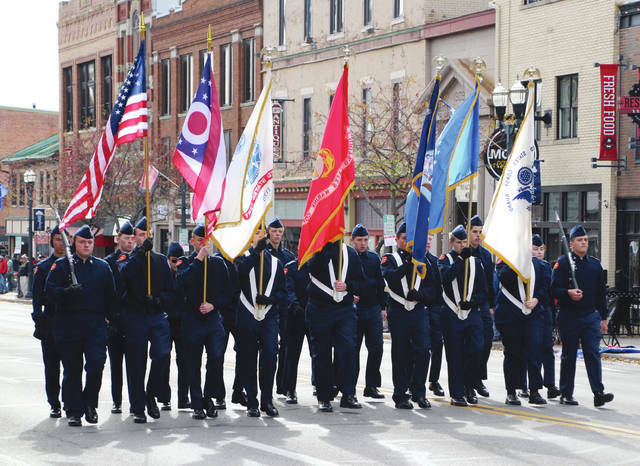 Members of the Delaware County Air Force Junior ROTC carry the flags of the various branches of the United States military during the annual Veterans Day parade on Saturday in downtown Delaware. According to parade organizers, more than 500 participants joined in this year’s parade. Four veterans were honored as grand marshals: William Adams, Bob Burr, Lynn Ramey, and Kenny Shears. Check out The Delaware Gazette’s Twitter feed (@delgazette) and Facebook page for more images from the parade.